People always talk about Tuscany as one of the most beautiful places in Italy (if not the world), and while I haven’t been there yet I don’t doubt it. But I’d like to add to the list of beautiful places in Italy: Paestum, in Cilento, Campagnia. After eight days in crazy, over-the-top Napoli, the Cilento countryside felt like a break from reality. Even though it was cloudy and rainy (as it has been everyday), the overwhelming majesty (while cliché, that’s not an exaggeration, I promise) of the mountains and valley stretching to the coast seemed magical. Pictures really don’t do it justice. Nestled in these rolling hills is Maida Farm. Although Francesco speaks only a tiny bit of English and I speak even less Italian, he welcomed Zac and me into his family’s home and showed us generosity that, in his words, is only typical for southern Italians, but to us felt extraordinary. Through hand gestures and lots of pointing, Francesco led me on a tour of his factory and surrounding fields. He pointed out the pressure cooker where they blanch the freshly-picked vegetables, the grill where they grill artichokes (carciofi – I’ll never get tired of that word!) 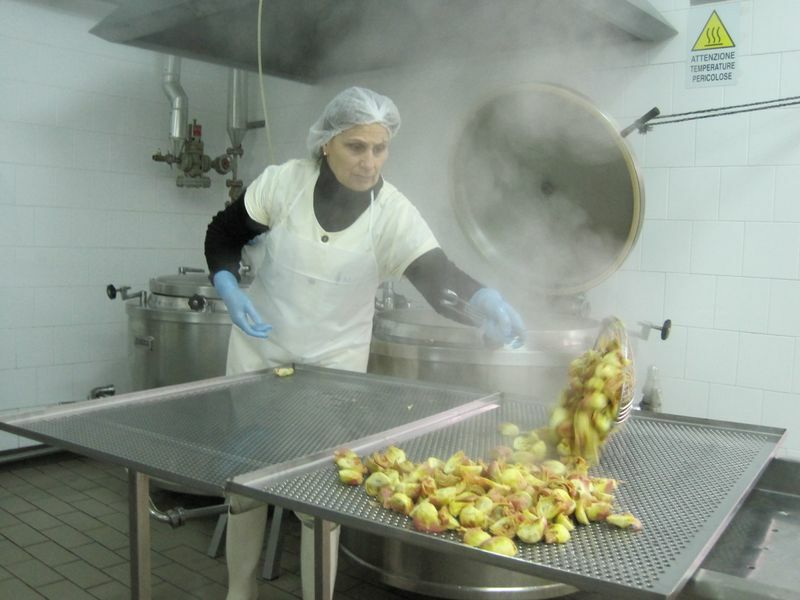 and onions before jarring, and the machine that fills each jar with the highest-quality extra virgin olive oil. I watched his employees trim and cut artichokes in preparation for jarring. I saw his storage room, with all of his amazing preserves: pumpkin, sundried tomatoes, olives, beans, peppers, apple, pear and fig jam, and more. Such simple ingredients yet complexity of taste all in one jar! It’s all about capturing what’s in season and preserving it so that it’s enjoyable all year round. 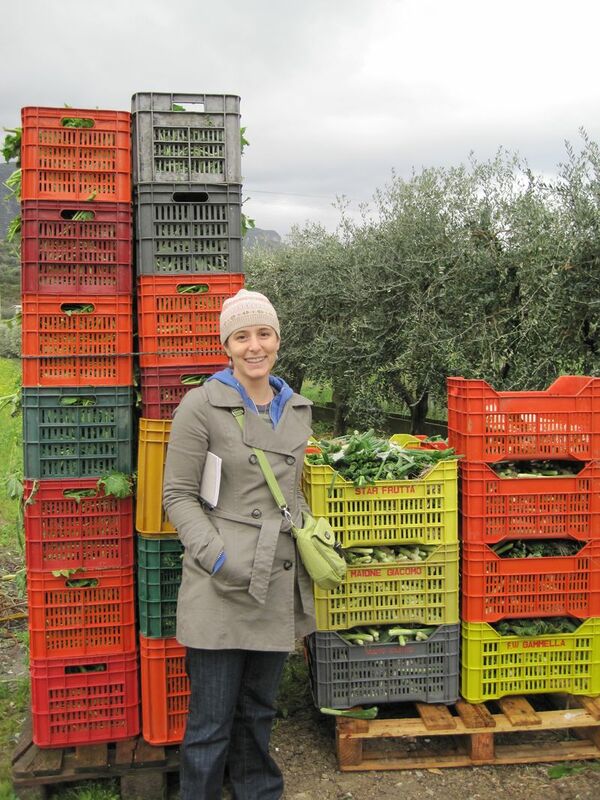 The fruits and vegetables are picked at their prime, and all are specific to the Cilento region. That day, it happened to be artichokes and onions (Camille and onions crates, left). Next season, Francesco said he will move on to tomatoes, eggplants, and other summer crops. And the freshness is obvious. I can say that with confidence, because Francesco’s generosity didn’t stop with a tour of his production – he also invited Zac and me into his home for lunch, dinner and breakfast. 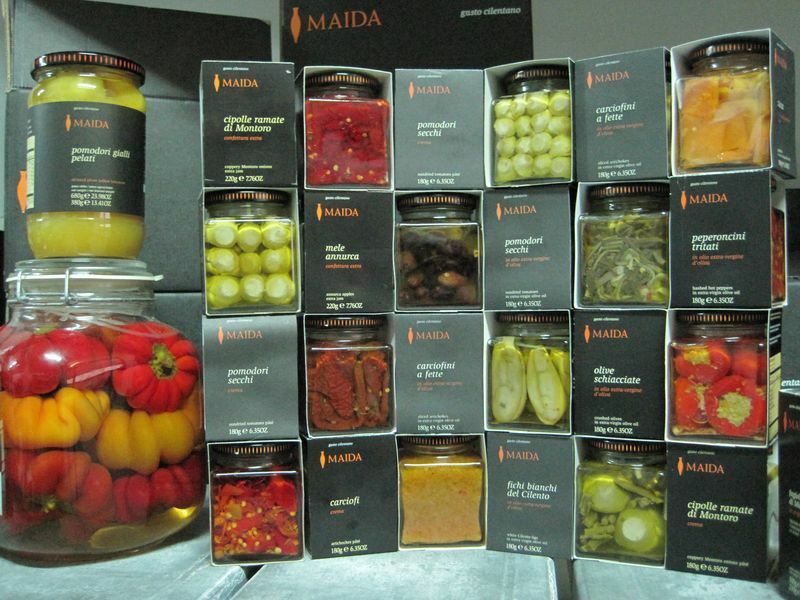 ps from Gustiamo – we want you to try all products by Masseria Maida. If you buy at least 3 items by Masseria Maida, we’ll add a jar of yellow tomato puree, on us. Magic word (to be added in the special instruction box of your shopping cart) is “Camille”. Why? Cammille loved all Francesco’s products and thought the yellow tomatoes were very interesting, tasteful and perfect for a light tomato sauce. We want you to try them, too. This “promozione” is valid until April 30. Grazie. Next Post food52.com: Gustiamo’s tagline is “Italy’s Best Foods” and it’s really true. Ciao Beatrice and Camille. 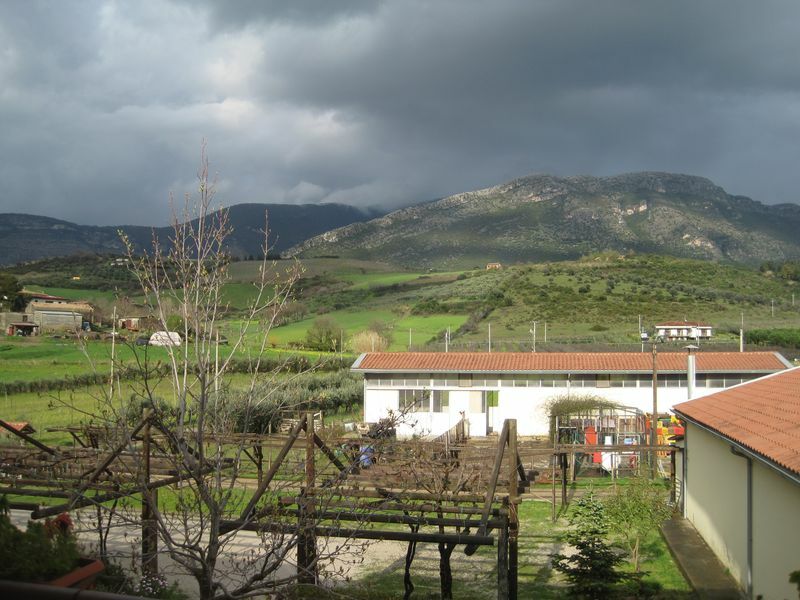 Now we need to visit Campagna, which we are doing next week. Do you think we can make a day trip from Napoli to see the pastamakers in Gragnano? Any tips on where to find a shop in Napoli that sells some of these wonderful artisan products? We can cook with them while in Italy then we’ll need to buy them from Gustaimo upon our return. Grazie mille.